Recently, Wells Fargo was ordered to repay a former employee back pay and to reinstate her to her former position after she was terminated for whistleblowing. If you were fired for reporting a workplace violation and want to learn more about filing your own claim for compensation, please contact a wrongful termination lawyer as soon as possible. Federal law prohibits companies from firing employees who alert the authorities to overtime, health code, and wage and hour violations, in addition to general unlawful conduct. For example, Wells Fargo came under fire in 2010 for forcing employees to meet aggressive sales goals targets, as a result of which many bankers were forced to open multiple accounts per customer. In fact, investigations revealed that at least two million unauthorized accounts were created between 2011 and 2015 in order to boost its sales figures. Prosecutors were alerted to the unlawful activity by a branch manager working in California who reported the misconduct to the Department of Labor’s Occupational Safety and Health Administration (OSHA). 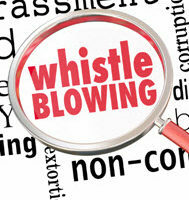 The whistleblower was later terminated by the bank. Fortunately, this type of retaliatory conduct is strictly prohibited under federal whistleblower protection laws, so when the former employee filed a claim against Wells Fargo, she was awarded $577,500 in back pay, attorneys’ fees, and compensatory damages. The bank was also ordered to clear the plaintiff’s personnel file and to post notices that inform other employees about federal whistleblower protection laws. Wells Fargo has since appealed OSHA’s findings. Reassigning duties that could affect eligibility for promotion. Employees who have been the victim of this type of retaliation have the right to file a complaint. However, the claim must be filed within a certain time frame, which varies depending on the type of complaint in question. Once the claim is received, OSHA conducts an interview with the complainant, at which point it determines whether an investigation is needed. If an investigation later unearths evidence that supports the worker’s claim of discrimination, then OSHA can ask the employer to rehire the employee and provide him or her with back pay and benefits. Unfortunately, the filing process is notoriously complex and many legitimate claims are denied every year, so if you were fired, demoted, or denied a promotion after making a complaint at work, it is critical to consult with a wrongful termination attorney who can assist you. To speak with one of the experienced wrongful termination lawyers at Saady & Saxe, P.A. Attorneys At Law about your own case, please call 813-909-8855 today. Our dedicated Tampa legal team is eager to assist you today.